This quilt started as part of my September square cutting marathon. After more than 5 weeks away from my sewing machine, I was desperate to start a few new projects and tried to pick some simple ones in the hopes that they wouldn't become long-term WIPs. This strategy was obviously a good one since a little more than 2 months later, I'm proud to say that this little baby quilt is done and off to its new home. The pattern was really simple and quick to put together. In about a week of leisurely sewing, I had a completed top. 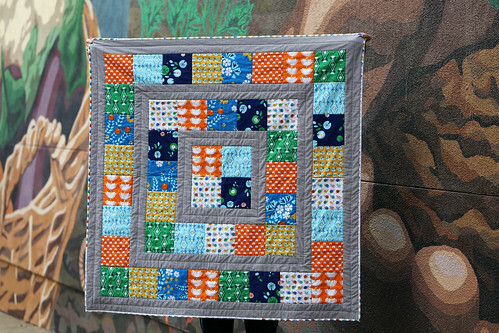 I didn't do anything too fancy with the quilting, opting to stick with stitch-in-the-ditch and adding another quilting line in the middle of each round of sashing to highlight the patchwork squares. I backed it using some Lotus Pond yardage I had originally picked up to make a crib sheet and used a AMH voile scrap to make it wide enough. The effect is simple but it adds a bit of interest to an otherwise plain backing. 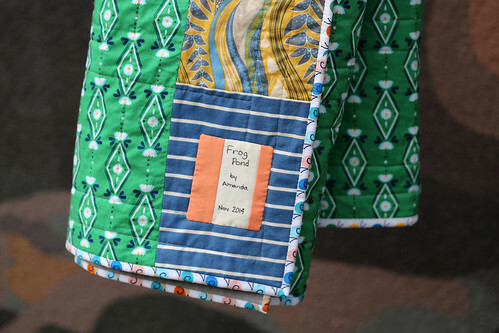 I also like that it adds some extra softness to the quilt. A little gaffer wrapped in this quilt might find a bit of comfort holding this soft strip voile up to his cheek. The label is a leftover bit from the Red Letter Day quilt we made for my cousin's wedding in July. It's not a perfect match but I like how it echos the coraly pink in the binding. Linking up to Finish it up Friday over at Crazy Mom Quilts. That's so cute! I love the way the quilting pulls the whole thing together. great quilt!! 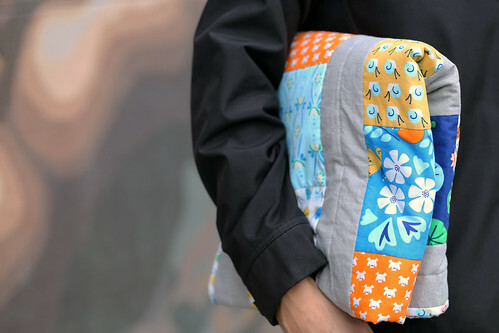 Lotus Pond is such a great line and your quilt showcases it perfectly!! Love your use of Lotus Pond here. 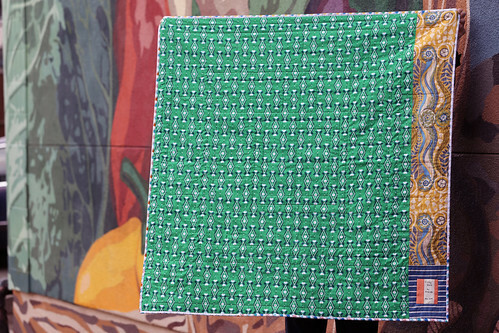 The chunky squares preserve the design of the fabric, letting it take the spotlight. Honestly, it never would have occurred to me to mix quilting cottons with a voile on the back like that (although I, too, have a lot of Lotus Pond as well as scraps of that AMH voile!). Have you done that on previous quilts? Any words of advice when quilting with voiles? From K - Blogathon Canada Giveaway Winner! From K - Bengal Giveaway Winner! From K - New Bengal Fabric and a Giveaway! Blogathon Canada - Coming Soon!